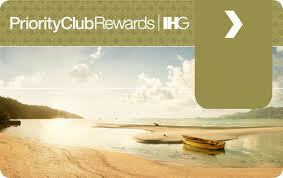 500 free Priority Club points for everyone! With my wife’s first Priority Club Black credit card statement this month was a leaflet promoting Priority Club Shopping. This is Priority Club’s version of the Avios e-store, where you can earn points (at what looks like pretty poor rates compared to Quidco or the Avios store) for launching your online shopping via their portal. Anyway … to promote this service, Priority Club (the loyalty scheme for Holiday Inn, Crowne Plaza and InterContinental) is offering 500 PC points to everyone who signs up for their shopping newsletter. This promotion runs from 12 August to 15 September. It does not say that it is restricted to UK Priority Club members, although it might be. You can sign up for the newsletter here – www.priorityclub.com/shoppingbonus I would resist the temptation to unsubscribe until the points have posted, just in case. Found this offer yesterday on an add with my daughters priority statement. Have tried to register a few times but still can’t seem to get it right!. i.e. No points or notice of registering. You should get an email saying that you have registered for the newsletter. There is no mention of the 500 points anywhere except for the landing page I link to above, and they do not post instantly – give it a week or so. I had signed up for this some 2 weeks ago, but still haven’t received the points. How long did it take for you to post? Must add that I had received an email back in July with this offer, whereas now the website says it is valid from 12-Aug.
Only signed up last night! Honestly no idea how long it will take. However, it is only 500 points (about £2.50 of value) at the end of the day. Even if they never appear I won’t be complaining or in any way losing sleep over it! Yes, I also signed up my whole family when I saw this offer in late June or early July, but none of the points have posted. Will try to be more patient ……..! Also signed upto this a couple of months ago. Just checked and the points were never awarded.